Fairytales and Fitness: A Peek In Our Week and A Product Update! Hello Folks! We hope you had a great week and weekend. We used most of last week as a recovery week from our Rock n Roll Virginia Beach Half Marathon last Sunday. I got a new work schedule so I didn't get my usual runs in that I like to do. Even though I did take some rest days, I did get one 3 mile run in and one 4 mile run in. I also caught up with some college friends and had a girls night one night last week. I on the other hand went another week without any runs, hey, I call it recovery, right? 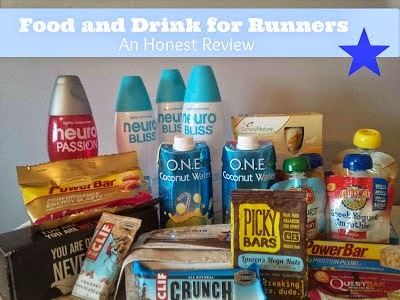 Remember last month we posted an Honest Review of food and drink for Runners? Well we mentioned a drink called Neuro Bliss and Neuro Passion. The Neuro people must have read our post because they contacted us to let us know that they have re-formulated their drinks. They were nice enough to send us each a case to try. Neuro Bliss - The flavor is Summer Citrus Berry. This one is still my favorite. I like the taste of this and didn't think the formula changed that much if at all. It was still great. Neuro Sonic -Blood Orange Passion flavored. I'm thinking since this is still in a red bottle that it was suppose to replace Neuro Passion ( the one I mentioned in the last post). I can say that this drink did not give me a headache this time. Neuro Sleep - Mellow Mango flavored. I don't like Mango flavored stuff so I wasn't a fan of this one. Neuro Daily- Tangerine Citrus flavor. This tasted like lemon lime and reminded me of a lighter version of 7-UP. The Neuro people gave us some really great products to giveaway at our Runner Meet Up in Disney in January. Yes, we are planning a meet up so stay tuned for some more info on it next month. And speaking of giveaways, we are going to be Co-hosting a Giveaway blog hop with the lovely Kristy from Runaway Bridal Planner. We would love for you to participate by either hosting a giveaway of your own and linking it up with us or by visiting all the great blogs that will be linking up! Be sure to check out Kristy's blog for more details. What did you do this weekend? Are you a football fan? 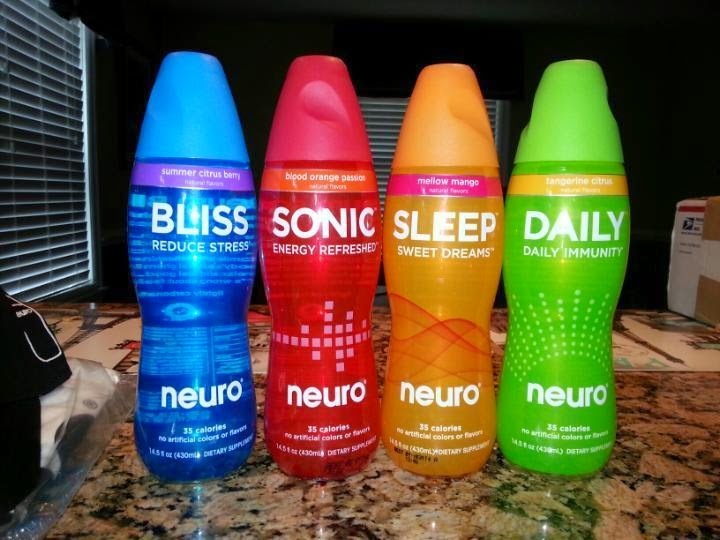 The Neuro drinks sounds really interesting - can you pick them up at any grocery store? I have seen them in Target and Giant! So great that the Neuro people re-formulated their drink and came back to you! Yay to football! I am excited for the link up giveaway! Such a great idea! Oh good! We are glad you will be participating! I've tried Neuro Bliss (the one for sleep) in the past and I liked it, although I'm not sure it helped all that much...but I'm a hard sleeper anyway. It's neat that they reached out to you and allowed you to try their new formula! :) I'm not a super huge football fan, but it played in our house all weekend (cause of my husband). I'm more of a baseball fan myself! Yea, I was surprised that the neuro people even found our post since we didn't even tag them on it. Their marketing team is surely doing their job! I've never tried any of the Neuro products, but it shows they are good at listening/reading feedback on their drinks, which in my book is a good sign! Our weekend was great, our son started soccer lessons, so that was the highlight of my weekend, we had such a blast running on the field! I did see Ashton's soccer picture on FB, so cute! Sometimes I wonder about products such as Neuro Bliss...are there any facts or tests that prove what it says it is supposed to do? I kind of think it's a mental thing...like a placebo effect possibly? Or maybe I am totally wrong and it does what it is supposed to do! I've never tried it so I don't know. That is great you were able to go to a football game this weekend!! My husband and I spent most of our weekend enjoying football games on TV! I think those drinks are good for a refreshing drink but thats about it! I've never tried these but they look interesting. It's great that the company responded to you. Yea, it shows they are a great company! I have seen the Neuro drinks and always wondered about them. I am going to definitely try them now. Let us know which one you try! Haha yes, I know some from DWTS too! Those Neuro drinks sound really good. I don't think we can get them here in the UK though. I bet if you contacted them they might send you some sample! I ran 14 miles this weekend and it was tiring. MCM training will be tough, but if our weather would actually turn to fall I would enjoy it more. We are happy football season is in full swing and the US Open tennis has been fun to watch on TV! I think after running in the VA beach heat, all training is cooler now! Hurting yourself at home right before a race is totally something I would I do! Such a clutz. I'm glad you were okay and it didn't affect your race! I've never tried the neuro drinks. They have them on campus, but I always stick to water! I haven't tried the neuro drinks- I am kind of a skeptic to that kind of stuff. 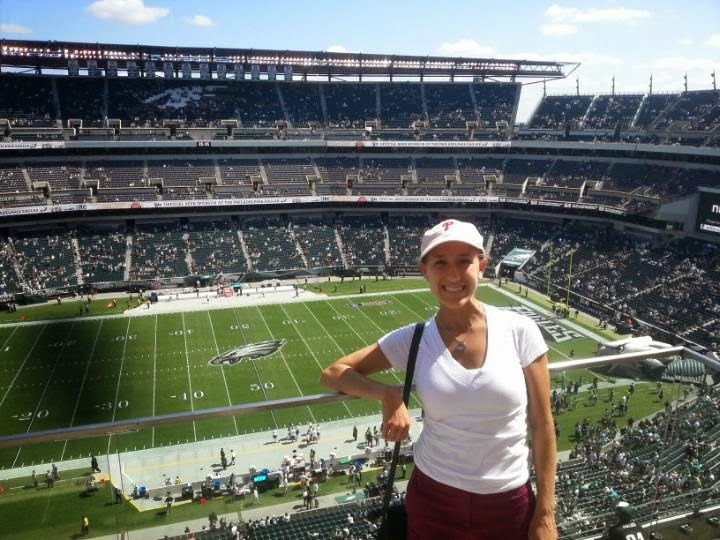 Love football season and I am looking forward to the blog hop!! Have a great week and don't hurt yourself! Ouch on the bloody shin part! That would be something I would do, be totally ready for a race and then stub my toe or bang into something while getting ready the morning of the race, heck it actually has been something I've done in the past:) Luckily you were still able to get out and enjoy an awesome race!!!! Awesome about the football game too! I love college football, but can't say I have ever been to a game in a huge stadium like that, very cool! Haha, I've always just assumed that drinks like these make enough promises on the packaging that you THINK you're feeling more energetic, etc. I bet they taste good/are refreshing, though! Always happens that you nurse some kind of injury back and then you bump into something right?! I've done that a few times. I am excited to join in with the blog hop next week for the first time! I have never heard of those drinks! Can you find them in the store? 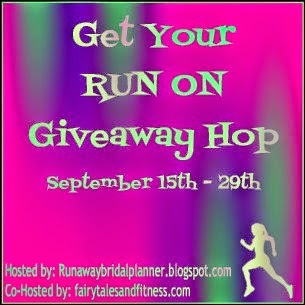 I will be joining in with the giveaway hop next week! Can't wait! That I do not know. I'm sure you could contact them (maybe by twitter) and ask. Glad you got a great sleep!